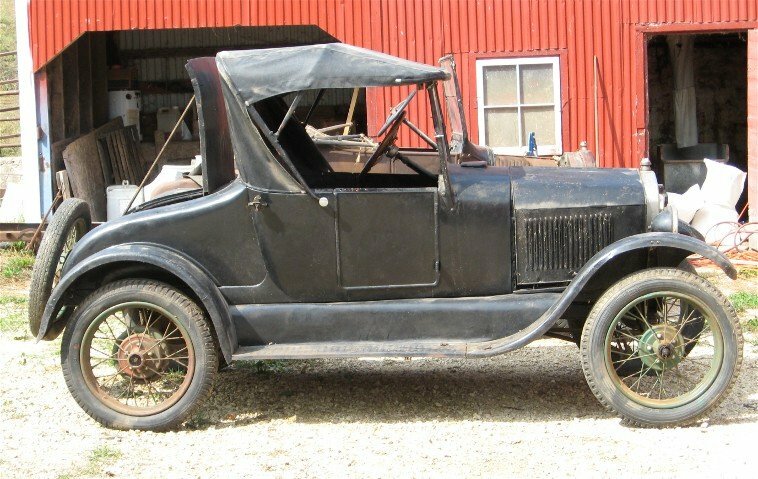 This is the Model T as I first saw it. Imagine, a Model T roadster! It is pictured next to a Touring car that is hard to see behind the Roadster. The Turing car was rather rough and incomplete so I was not as interested in it but I needed the Roadster. Here the T is in the barn at home with the Diamond T project in the background. Here is another view of the roadster. The Cat has been rolled out and the "T" has been rolled into the shop for the winter. Note the "fat man" steering wheel. On most Model Ts the driver side had no functioning door, just a panel that looked like a door. On this car there is a door but there is only about 5 inches between the steering wheel and the back of the door opening. Several aftermarket options for steering wheels were available to ease the problem. This fat man steering wheel has a sliding frame that allows the wheel to be scooted over to ease the entry of the fat man. The disassembly of the "T" has begun. The fabric top has been removed and the top bows folded back. I considered reusing the top fabric because it was in pretty good shape. It turns out that it was not the "correct" material so I will be replacing it anyway. In an earlier restoration someone had used top material for a closed car, a much heavier fabric which made it impossible to avoid pleats and wrinkles at the corners. Next to go was the hood, steering column, radiator and radiator shell, and the aftermarket water pump. The throttle is controlled by a hand lever on the steering column with no foot control. The carburetor is on the other side of the engine. An example of the no-nonsense engineering is the fact that they just cast an opening right though the engine block to provide a simple path to the carburetor for the throttle control rod, the hooked rod seen sticking out of the block. Another after market accessory this car is equipped with is the external oil tube. This tube is seen running from the top of the flywheel housing down to the front of the engine. The Model T has no oil pump but lubricates its engine by slinging oil up to a gathering funnel inside the flywheel housing were it is conducted by gravity in an oil tube inside the engine. The problem is that the oil tube has only a gentle slope so the front main bearing does not get oil when the car is driven up a long steep grade. Here the windshield and stanchions, top bows, fuel tank, seat and front fender and wheels have been removed. The front fenders and splash aprons have been removed and the body has been unbolted from the frame, lifted and slid back. This enabled the foot pedals to clear the firewall while removing the engine. A crack in a frame bracket needed some strategically applied force to bring it into position for welding. After welding and refinishing the surface the repair is undetectable. A new rivet was installed in the hole. The radius rods and the driveshaft and tube have been removed from the rear axle housing. Very, very thick oil is draining into the shallow pan below the driveshaft opening. The brake back-plates contained nothing but cobwebs. No brake parts except for well worn actuating cams. This did not matter anyway because the brake operating rods had also been disconnected. The Model T had a hand operated parking or emergency brakes acting on cast iron shoes directly on steel drums. These were very ineffective for braking, especially if grease and oil had seeped out of the axle housing into the brakes. They were intended for use just as parking brakes anyway. Modern replacement brake shoes have riveted linings which make them effective as brakes. The axle housing has been parted at the differential to inspect the gears, thrust washers and bearings. The differential and axles have been removed from the housing. Not at all what I was expecting. What seemed like minimal end play in the axles was just that the ultra thick oil prevented them from moving. It turns out that the two thrust washers were the original babbitt type and had disintegrated into a pile of grindings, some of which are seen on the paper towel. Modern replacements are made of bronze. This is most of the remains of the thrust washers that were about 3/16" thick and 3 1/2" in diameter. The foot brake in a Model T operates on a drum in the transmission. Without these spacers it would be possible for the axle ring gear to move away from the pinion gear, disconnecting the transmission from the axles with the resulting loss of brakes. There are no brakes on the front wheels of a Model T.
Here we see the differential and ring gear still assembled on the drive axles. The thrust washers rotate between the large steel washers which are each pinned to the differential and to the axle housing. I made a long wash tank out of halves of a discarded 100 lb. propane tank. No picture of the gears was taken before this preliminary cleaning. The cleaning was a nasty job but somebody had to do it. Uncovering the works was like an archaeologist's dig. I did not know what lie below. The cleaning solution was a mix of kerosene and a commercial parts cleaning solvent. The clamp-lever I made to clamp to the hydraulic pump coupling to try to free the stuck engine of the D4 came in handy as a bench tool to hold the axle housing for service. A modern reproduction of the original Ford shop bench tool can be purchased for $199.50 plus shipping. The U-joint is removed from the drive shaft by drilling partially though the retaining pin and driving the pin out. The U-joint then slides off the shaft and the shaft can be pulled out from the other end of the tube. The steel pins that secure the steel thrust washers sometimes get sheared off. Here they are being removed for replacement with new ones. The old pin is drilled and tapped and a small machine screw is threaded into them and pulled out with the small cupped shaped extraction tool. A wire wheel on a flexible shaft makes short work of removing the black paint for refinishing. The red primer that must have been applied at the factory will not come off. Fine! A new bushing with a thrust surface has been installed in the driveshaft tube. A dial indicator is set up to measure the end play of the shaft. The Model T shop manual states that the bushing should be machined to provide .002 to .005 inches of end play of the shaft. How about .002? Reproduction parts are not always accurately made. Here the brake cam lugs are milled back to make room for the operating cam. After this was finished I still had to remove one lug and drill new holes and remount the lug about 1/4 of an inch further over. The rusted brake rods and clevises have been successfully unscrewed and will be cleaned for painting. The hooked shaped items are brake rod anti-rattle supports. This photo was actually made as a photo note so the composition was not considered. The steering column is undergoing disassembly. The small levers on the rods control the throttle and spark advance. A new bushing has been installed in the shaft bracket. The control rods and levers must be removed to dismantle the assembly for refinishing. The suggested method of removing the pins that position the control levers on the rods is to just shear them off. The drill press vice and steel block provide mass to the rod so the lever pin can be sheared. The stack of sockets and a hammer worked just fine. This is the generator brush mount. Modern fiberglas substitutes of excellent quality replaced the badly deteriorated fiber insulator. The starter brush assembly was in the same condition. The ends of the axles in the differential are separated by modern fiber disks that are ground down for proper thickness by trial and error until the axles can turn freely but have no end play---a tedious operation requiring the differential to be taken apart for each try. The new bronze thrust washers are in the foreground. The aluminum clamp is again employed in assembling the rear axle. The drive shaft tube is attached to the left half of the axle housing and supported by an adjustable stand. With the drive shaft installed and clamped the clearance between the pinion and ring gear can be checked and adjusted. Here a dial gauge indicator shows the ring gear turned to the pinion gear in one direction and set to zero. With the ring gear turned in the other direction the movement is measured. A "lash" of .012" is just fine. The factory allowed up to .032". The differential should run smoothly with very little gear noise. Adjusting to achieve this is another trial and error procedure. The ring gear-pinion clearance is adjusted using shims behind the ring gear or behind the thrust washers. A variety of shim thicknesses and location will eventually get it right. The axles roll directly on wide roller bearings. If the axle is worn it must be replaced. Replaceable steel sleeves provide bearing surface in the axle housings. Here a new sleeve is inserted in the housing using hose clamps to squeeze the spring steel sleeve down to insert it. The sleeve is made with a V shaped slit to allow it to fit the housing tube. When inserted there is a gap in the surface but the rollers roll smoothly over the V opening. The Ford repair Shop Manual time-study allows 3 1/2 hours for one man to remove, overhaul and replace the rear axle. I was ok with 3 1/2 days. Moving right along, here is one of the brake drums being cleaned up. A 3-M paint-remover disk in the drill press does a great job. After making a turn or two the disk is lowered about 1/4" and repeated. Aside from a little surface rust the brake surface was in great shape. The frame has been sandblasted and painted and has been waiting for its parts since last fall. It took most of the winter to finish cleaning and painting the running gear. Now the axles and all moving parts have been painted and equipped with new bushing and bearings. Brand new brakes are installed. Compare to photo 9. I am making an adapter to mount the engine to a borrowed engine stand. Soon the engine work will begin. This is the end of the disassembly and frame restoration section of the “T” project.